LinkedIn Learning App Data & Review - Education - Apps Rankings! 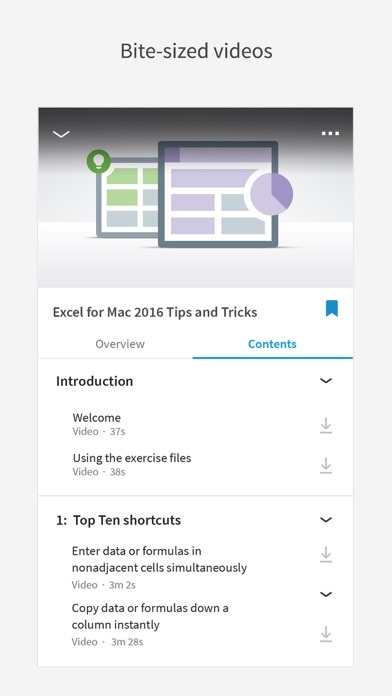 Learn on the go with the LinkedIn Learning iOS app. Learn from courses taught by industry experts in leadership, management, marketing, programming, IT, photography, graphic design, web and interactive design, 3D animation and much more. 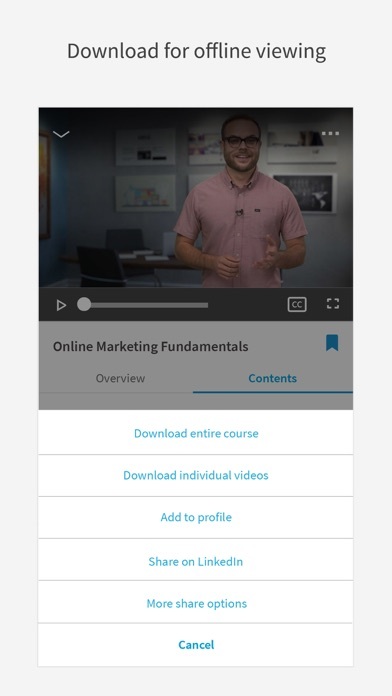 LinkedIn Learning app is free to download. With a subscription plan, you can watch the full courses across technology, creative and business topics. If you choose to subscribe, your subscription will automatically renew and will charge your credit card through iTunes account, unless auto-renew is turned off at least 24-hours before the end of the current period. You can turn off auto-renew at any time from your iTunes account settings. The applications LinkedIn Learning was published in the category Education on 2016-09-22 and was developed by LinkedIn Corporation. The file size is 84.12 MB. The current version is 1.1.97 and works well on 10.0 and high ios versions. 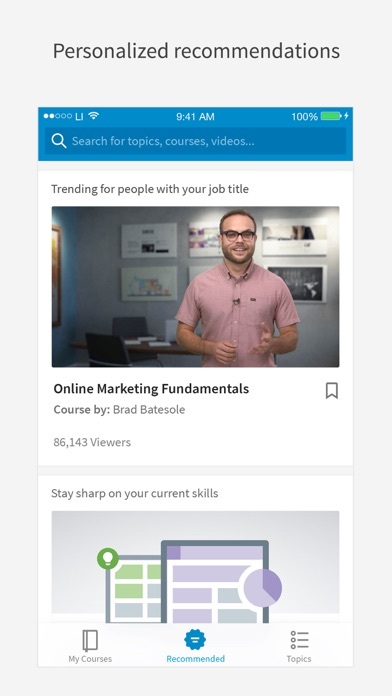 We update LinkedIn Learning frequently to improve your learning experience led by more than 800 industry experts chosen from around the world. Visit weekly to see what's new. Love LinkedIn Learning? Rate the app! Your feedback shows us what matters. Plus: the app includes a Help Center to answer your questions. Do you like LinkedIn Learning applications? Please share! Such a wealth of information on this app. Download it, I’m sure you’ll find a course on something you’d like to learn about. 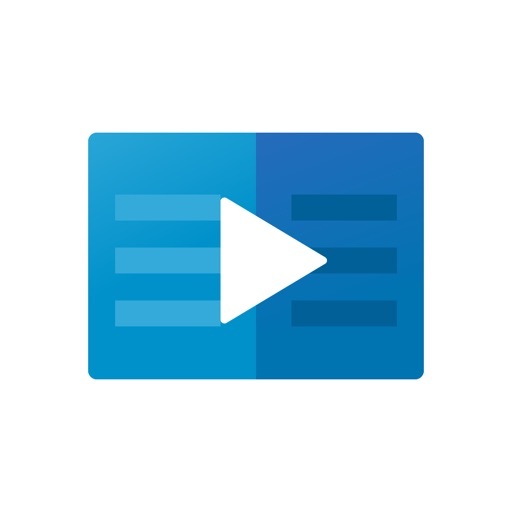 Can’t use the Lynda Apple TV app anymore for learning so please give us a LinkedIn learning Apple TV app. It was so much easier and better with a TV app. Frustrating while we are casting using chrome cast: 1. Can’t change the speed. Is fixed to x 1. 2. Need to select each video manually. Won’t go to next one by itself. The UX is really not good for iPad users, • the video thumbnail list takes too many space on the iPad, it would be great if they can be displayed in a modular grid like the old Lynda.com • there’s no way to add note in app, and each time you add note on the web, you have to jump back n forth between the content pane and note pane (especially when u want to insert the note on the exact playhead location) • no landscape view. This basically is why I give it a 3 ★, the display is always on the wrong orientation every time I jump back from video full screen view. I guess i am not clear on how this app works because 1. i can see advertising to start trial period takes over my iPhone screen and distracting me from main video to learn the topic 2. then there is small video section 3. below it there is the index highlighting the sequence of section. 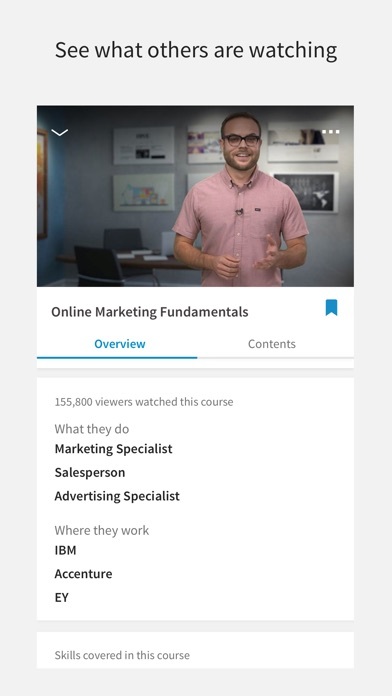 UI, for me was not good experience Also, I see some training in LinkedIn, is there a way for me to add it to my list of videos for me to learn in my free time. This site has helped me to learn many things about various software and website development. It has saved me a lot of money and frustration. I would recommend this to anyone trying to extend their knowledge. While I understand the move from a design decision, post moving all Lynda.com courses to LinkedIn Learning, to no longer allow LinkedIn Premium members to log into the Lynda.com app, I’m disappointed that the LinkedIn Learning app does not support the resolution of the new 11-inch iPad Pro yet. The Lynda.com iPad app was updated weeks ago to support the full screen of the new 11-inch iPad Pro. 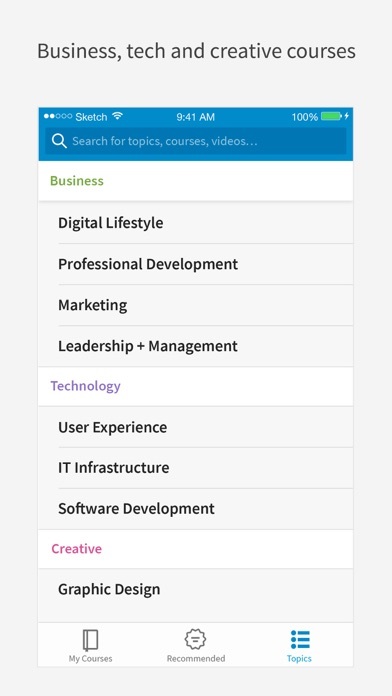 I’m starting to wonder where this falls on the product development roadmap for the LinkedIn Learning iPad app. Please bring support soon. 1-Unfortunately the videos are not compatible with iPhone X size of screen, as they are smaller, despite the possibility to increase and adjust the size of the videos to match the whole screen of IPhone X. 2-Also, every time I close the app, I need to login in when I open it again, which is really annoying. I wish that you fix these bugs in the coming updates. Investment of time was well with it, excellent class on AI and Machine Learning. To be clear, I’m rating the quality of the app not the content ... the app needs to be updated to take full advantage of the iPad Pro 12.9” screen (in particular the new iPad Pro 12.9” as that is what I’m using). Furthermore, it needs to support basic iPad features such as picture in picture, side by side app support etc. Overall the app works well (delivers videos) but needs these basic iPad features add to earn 5 stars. Thank you! Excellent course presentation. Rich with practical advice and great insights from cloud practitioner. In addition to technical details the presenter provides references to resources and current trends in the cloud world. LinkedIn learning is different from other learning resources which focuses more on content than the real world scenarios. CANNOT STREAM TO CHRIMECAST ONLYONE? I used to be able to stream thru chrome cast onto my TV and now that feature is not available to me. I want to sign in using my organization URL which is: umd.edu. 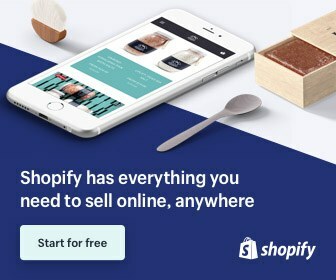 This URL works for me online, but doesn’t work for this app. Please fix! Despite having an enterprise subscription with my company and having downloaded the videos in the app, I cannot watch them cause they require a premium subscription. What a waste of time. Don't bother.